Are missing teeth causing you to hide your smile? Do the gaps in your bite make it difficult to chew your favorite foods? The great news is that modern implant dentistry is evolving rapidly and dental implants can be used to replace one or multiple missing teeth using materials that replicate the look and feel of your natural teeth. Dental implants not only improve the appearance of your smile, but they also restore the full function of your mouth. When a tooth or teeth are missing, the bone underneath begins to break down if it doesn’t receive proper stimulation. This can alter the appearance of your face, causing your lips to appear thin and your face to look older. Plus, when there’s an unfilled gap, the surrounding teeth may shift to fill that gap, which can alter your smile drastically and expose the surrounding teeth to greater instances of decay. Additionally, many denture-wearers can benefit from the use of dental implants. If you’ve ever experienced sores on your gums from loose-fitting, shifting dentures, ask us how we can provide a fixed solution with dental implants to give you the best-fitting set of teeth you’ve ever had. 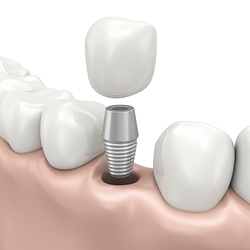 Recent advances in dental implant surgery have made it easier to place implants more precisely while using less-invasive surgical procedures. Dr. Freeman uses the most advanced dental imaging technology available to plan for and place implants. A CT scan yields detailed data that allows for ultimate control and precision in placement, and that means the best results for your dental implant treatment. To perform dental implant surgery, Dr. Freeman uses computer-based planning on a 3D model of your jaw. He creates data files and sends them to a dental lab where they create a unique surgical guide based on the individual conditions of each dental implant patient. This surgical guide may allow Dr. Freeman to place your dental implants without using a scalpel, which means less bleeding, less swelling, and less discomfort for you as we restore your smile with dental implants. Dr. Freeman is pleased to offer a procedure All-on-4. It’s a technique that allows denture wearers, and those who have teeth that can’t be restored, to have fixed teeth instead of traditional dentures. With this technique, imaging technology is used to create a prosthesis made up of 12 or more teeth. Then, four to six implants are placed surgically to anchor the prosthesis so you have a functional set of teeth that feel and perform just like natural teeth. Once healing is completed, you’ll have a natural looking smile and the best part is that you can again eat the foods you enjoy without worrying about your dentures slipping or falling out. Whether you’re a referring doctor or a patient interested in restoring your smile with dental implants, we’re here for you if you’re looking for an oral surgeon in Katy, Texas. Dr. Freeman uses the most advanced technology available to help you attain and enjoy a more functional and beautiful set of teeth and gums. If you have questions for your Katy oral surgeon, or if you would like to request a dental implant consultation, don’t hesitate to contact us. There is no better time than now to restore your smile with dental implants.